While reading the paper recently I was inspired by two 22-year old athletes; a Canadian triathlete and a golfer from Northern Ireland. One came into the weekend with a string of recent successes; the other was recovering from a crushing collapse at this year’s Masters. Regardless of their previous results and approach, recently, both had massive victories on the same day. After their victories both commented that their focus had been on their task. Paula Findlay, 22, won her 5th triathlon in 11 months and became the most-winning athlete ever in the world championship series. 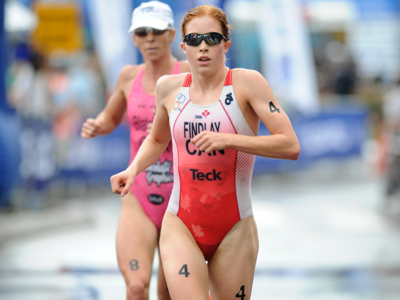 She is one of only three female triathletes in the world to win three straight races. Simply put – she is having a great year. Golfer Rory McIlroy’s performance in winning the U.S. (Golf) Open by a record breaking eight shots was outstanding, particularly when you consider that just two months ago he took a four-shot lead into the final round of the Masters, but shot 80 that day to drop way back, finishing tied for 15th. Rory credited simply playing well on those four days, and Paula made sure to stay in that moment. In a nut shell; your past results don’t determine today’s results- only today’s actions do that. Your preparation is a collection of what is done. Staying focused on what you are doing is the best way to achieve your goals. Take advantage of the opportunity of now. This entry was posted in Mentor Messages and tagged London 2012 by Marnie. Bookmark the permalink.